Name Variation Eliza Ann Mercer was also known as Anna Eliza. Eliza Ann Mercer was the daughter of William Mercer and Sidney Wollerton. Married Name 1830 As of 1830,her married name was Mercer. Mary M. Walker was born in 1806 at Pennsylvania. She married Kersey Mercer, son of William Mercer and Sidney Wollerton, in 1830. Mary M. Walker died on 17 January 1876 at Chester, Pennsylvania. 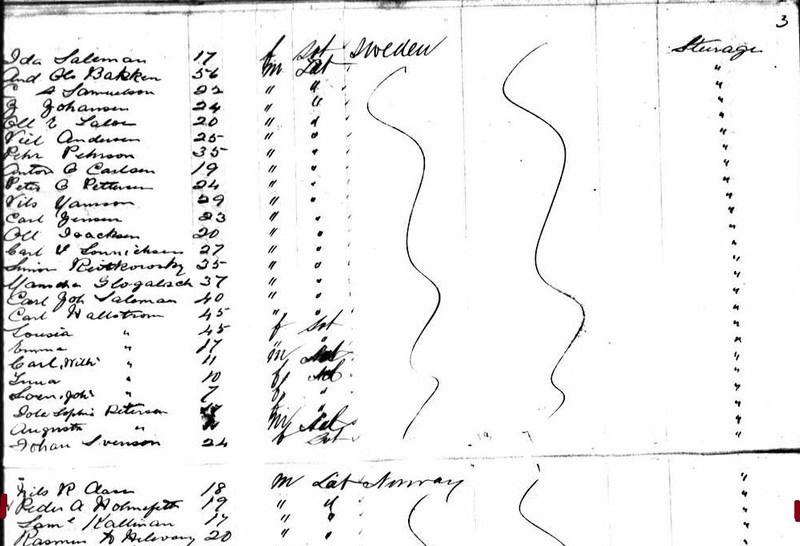 [S249] U.S. Federal Census 1850 U.S. Federal Census, by Ancestry.com, Stamp 233. Dwelling 154. [S247] U.S. Federal Census 1870 U.S. Federal Census, by Ancestry.com, Page 6. Dwelling 38. John Mercer was born in 1830 at Pennsylvania. He was the son of Kersey Mercer and Mary M. Walker. William Mercer was born on 3 January 1832 at Pennsylvania. William Mercer married Jemima W. Rogers on 18 April 1858. William Mercer died on 13 November 1921 at age 89. 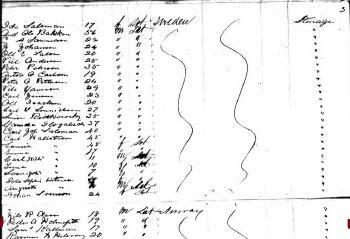 [S246] U.S. Federal Census 1880 U.S. Federal Census, by Ancestry.com, NA Film Number T9-1113 Page Number 172B. 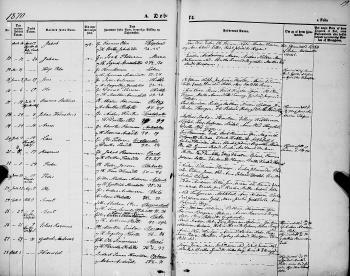 [S245] U.S. Federal Census 1900 U.S. Federal Census, by Ancestry.com, ED53. Dwelling 139. Joseph W. Mercer was born in 1833 at Pennsylvania. Joseph W. Mercer married Mary J. Ferrell, daughter of Sarah (? ), on 31 March 1857. Joseph W. Mercer died on 17 November 1911. [S247] U.S. Federal Census 1870 U.S. Federal Census, by Ancestry.com, Page 27. Dwelling 190. [S246] U.S. Federal Census 1880 U.S. Federal Census, by Ancestry.com, ED37. Dwelling 134. NA Film Number T9-1113. Sheet 40A. Name Variation Isaac Morgan Mercer was also known as Morgan. Isaac Morgan Mercer was born on 8 July 1835 at West Chester, Chester County, Pennsylvania. Isaac Morgan Mercer married Sarah Gilliland, daughter of Matthew Gilliland and Rachel McFarland, on 27 March 1862. Isaac Morgan Mercer died on 9 January 1920 at Coatesville, Chester County, Pennsylvania, at age 84. He was buried on 12 January 1920 at Grove Cemetery, Chester, Pennsylvania. [S247] U.S. Federal Census 1870 U.S. Federal Census, by Ancestry.com, Page 5. Dwelling 35. 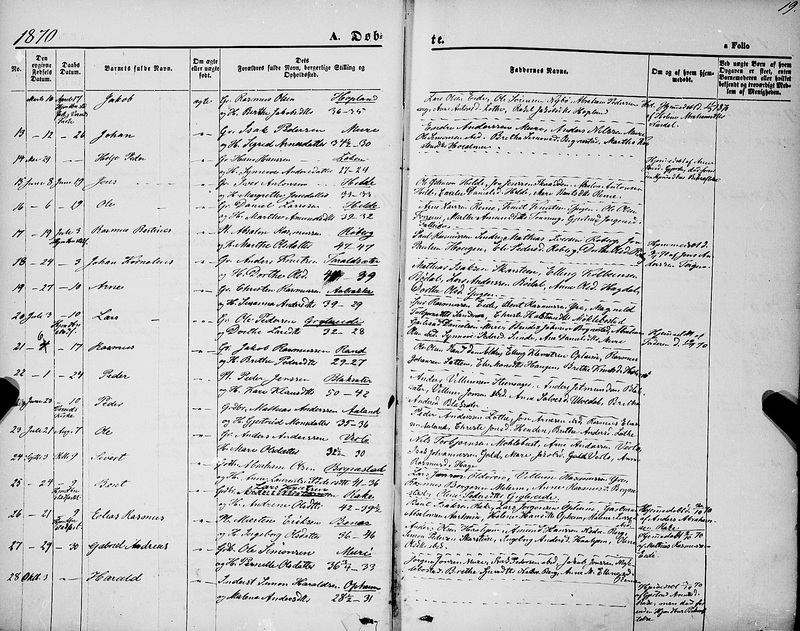 [S246] U.S. Federal Census 1880 U.S. Federal Census, by Ancestry.com, ED78. Dwelling 103. NA Film Number T9-1115. Sheet 159C. Name Variation Thomas Baker Mercer was also known as Baker. 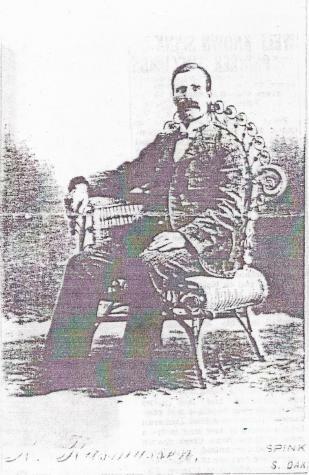 Thomas Baker Mercer married Emily A. (?). Thomas Baker Mercer was born in 1836 at Pennsylvania. 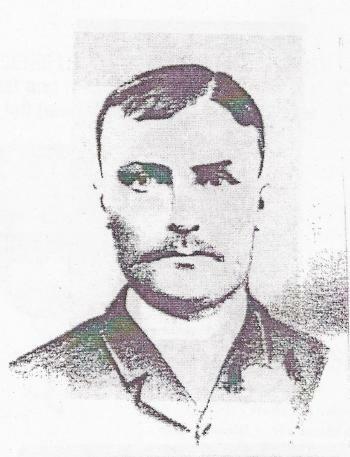 Thomas Baker Mercer died on 7 October 1900. Married Name 3 March 1862 As of 3 March 1862,her married name was . Sydney Mercer was born in 1838 at Pennsylvania. She was the daughter of Kersey Mercer and Mary M. Walker. Sydney Mercer married Thomas Alexander on 3 March 1862. [S246] U.S. Federal Census 1880 U.S. Federal Census, by Ancestry.com, NA Film Number T9-1113 Page Number 171D. Reuben McMinn C. Mercer was born circa 1842 at Pennsylvania. Reuben McMinn C. Mercer married Elizabeth M. Kinnard on 28 April 1870. [S247] U.S. Federal Census 1870 U.S. Federal Census, by Ancestry.com, Page 4. Dwelling 29. [S246] U.S. Federal Census 1880 U.S. Federal Census, by Ancestry.com, ED41. Dwelling 12. NA Film Number T9-1113. Sheet 84B. Franklin E. Mercer married Sue (?). Franklin E. Mercer was born in 1843 at Pennsylvania. Married Name before 1880 As of before 1880,her married name was Pierson. Mary Jane Mercer was born in 1846 at Pennsylvania. 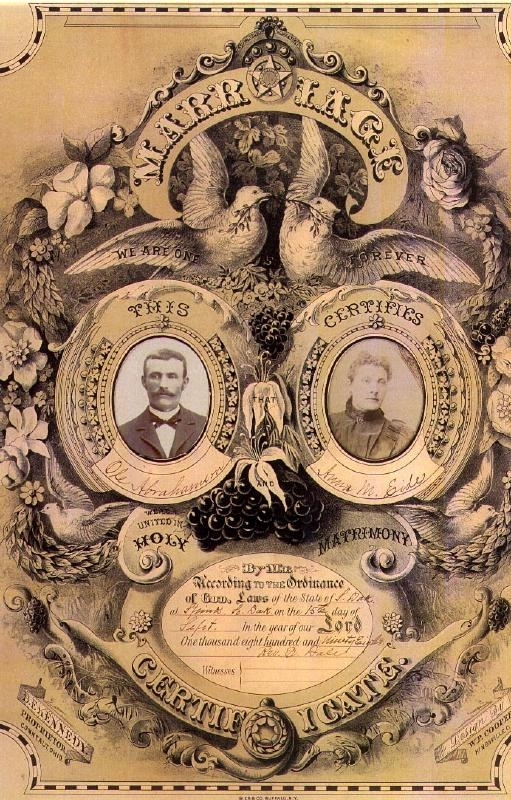 Mary Jane Mercer married William Pierson before 1880. [S246] U.S. Federal Census 1880 U.S. Federal Census, by Ancestry.com, ED46. Dwelling 130. NA Film Number T9-1113. Sheet 171C. Married Name Her married name was . Angelina Mercer was born in 1848 at Pennsylvania. Ziba C. W. Mercer was born on 25 June 1851 at Pennsylvania. Ziba C. W. Mercer died on 11 May 1923 at age 71. [S243] U.S. Federal Census 1920 U.S. Federal Census, by Ancestry.com, ED89. Dwelling 97. Nickname Sarah Gilliland also went by the name of Sallie. Married Name 27 March 1862 As of 27 March 1862,her married name was Mercer. Sarah Gilliland was born on 4 January 1840 at Delaware. She was the daughter of Matthew Gilliland and Rachel McFarland. Sarah Gilliland married Isaac Morgan Mercer, son of Kersey Mercer and Mary M. Walker, on 27 March 1862. Sarah Gilliland died on 8 January 1899 at age 59. She was the daughter of Isaac Morgan Mercer and Sarah Gilliland. [S13] Bible of Isaac Morgan Mercer. Name Variation William D. Mercer was also known as Willie. 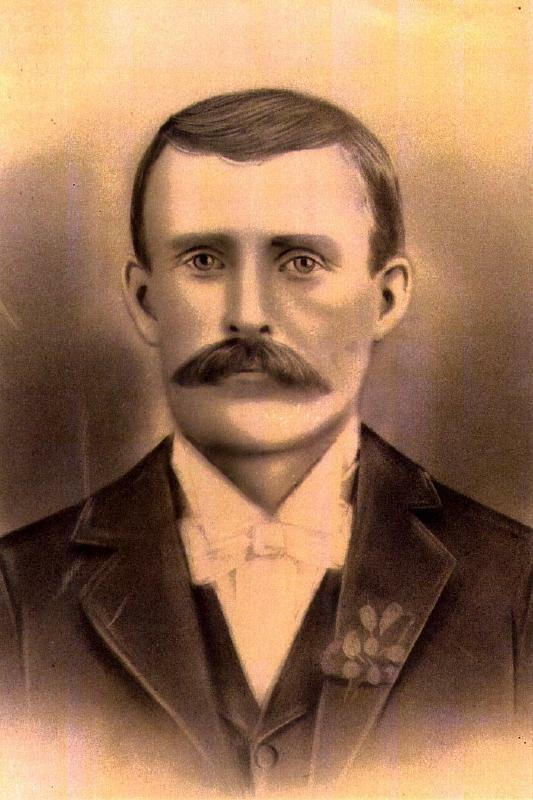 He was the son of Isaac Morgan Mercer and Sarah Gilliland. 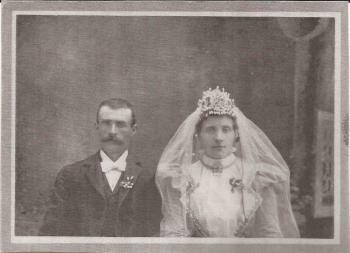 William D. Mercer married Ida Jennie Hertz circa 1899. William D. Mercer and Ida Jennie Hertz were divorced before April 1930. William D. Mercer died before 1953. [S245] U.S. Federal Census 1900 U.S. Federal Census, by Ancestry.com, Year: 1900; Census Place: Caln, Chester, Pennsylvania; Roll: T623_1392; Page: 3B; Enumeration District: 51. [S244] U.S. Federal Census 1910 U.S. Federal Census, by Ancestry.com, Year: 1910; Census Place: Caln, Chester, Pennsylvania; Roll: T624_1327; Page: 3A; Enumeration District: 0004; Image: 634; FHL Number: 1375340. [S243] U.S. Federal Census 1920 U.S. Federal Census, by Ancestry.com, ED5. Dwelling 35. Nickname Caroline Virginia Mercer also went by the name of Carrie. Married Name Her married name was MacDonald. Caroline Virginia Mercer married Samuel Francis MacDonald. Caroline Virginia Mercer died on 4 April 1937 at age 68. Thomas S. Mercer married Clara M. (?) circa 1898. Thomas S. Mercer died before 1930. Samuel Francis MacDonald married Caroline Virginia Mercer, daughter of Isaac Morgan Mercer and Sarah Gilliland. Name Variation Humphrey Wickersham was also known as Wichersham. He was the son of Thomas Wickersham and Ann Grover. 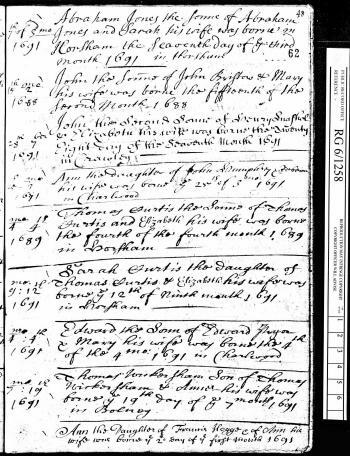 Humphrey Wickersham died on 24 October 1697 at run over by a wagon and died from the injury, England, at age 10 also reported as 1702. 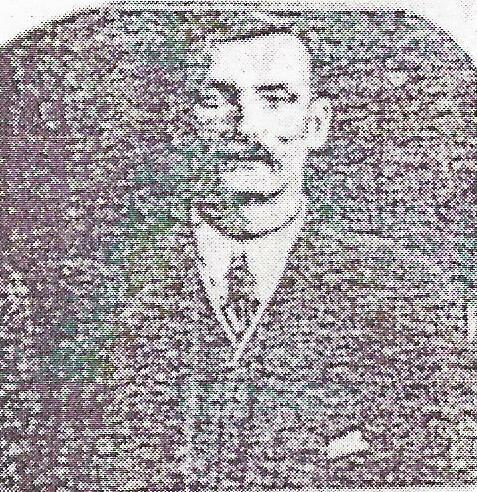 Name Variation Thomas Wickersham Jr. was also known as Wichersham. Thomas Wickersham Jr. married Abigail Johnson on 12 September 1719 at Chester, Pennsylvania. Thomas Wickersham Jr. died in 1726 at East Marlborough, Chester, Pennsylvania. After 1706 at Chester, Pennsylvania, Thomas Wickersham children birth dates Kennett Quaker Monthly Meeting. 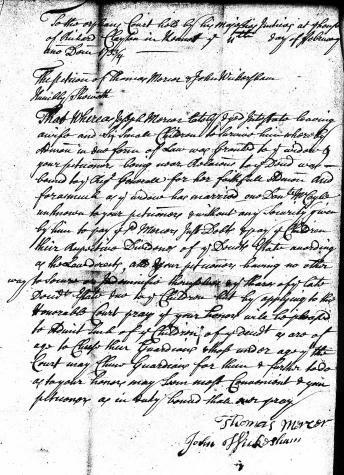 Thomas Wickersham Jr. left a will on 23 December 1726 Thomas Wickersham Jr, of Marlborough, yeoman. December 23, 1726. January 10, 1726.7. A. 214. To wife Abigail, plantation where I now dwell and all personal etate, she paying to eldest daughter Sarah £20 on day of her marriage and to youngest daughter Hannah £30 on her marriage. To only son Robert all remainder of lands, paying to his sisters Sarah and Hannah £5 each. To my brother John and sister Ann 20 shillings each. Executrix: wife Abigail. Witnesses: Richard Wickersham, Cales Johnson, Wm. Webb. Name Variation John Wickersham was also known as Wichersham. John Wickersham died in 1742 at Londerry, Chester, Pennsylvania. After 1706 at Chester, Pennsylvania, Thomas Wickersham children birth dates Kennett Quaker Monthly Meeting. 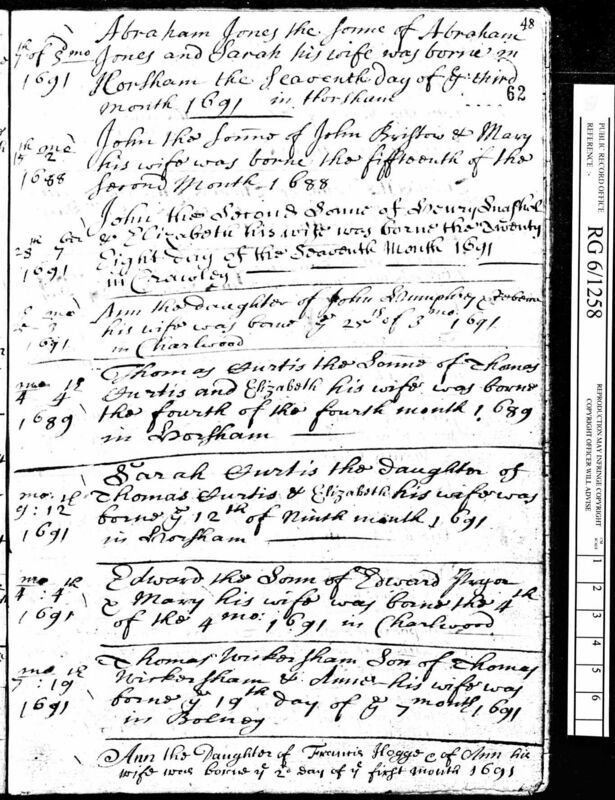 On 11 February 1733 at Orphan's Court, Chester, Pennsylvania, Request for guardianship for children of Joseph Mercer by uncles Thomas Mercer and John Wickersham; also listed as 1734. 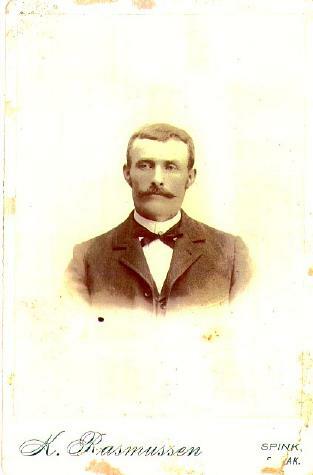 Name Variation Peder Abrahamson was also known as Abraham. Name Variation Peder Abrahamson was also known as Peder Abrahamsen Holmeseth. Peder Abrahamson was born on 12 December 1861 at Olden, Nordfjord, Norway. 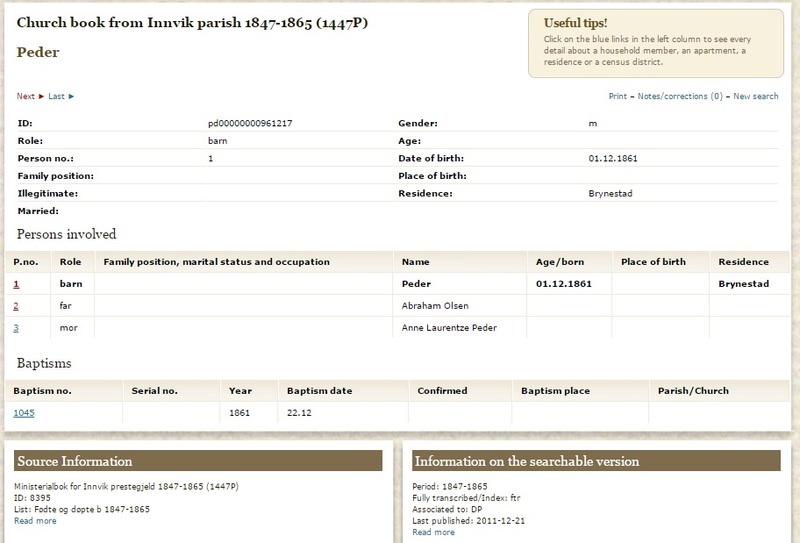 He was the son of Abraham Olson and Berte 'Anna' Gjytri. He married Julia Christine Christensen, daughter of Ole Ormbergstol Christensen and Ingeborg Johnsdatter Teigen, on 20 January 1891 at Brule Creek Church, Elk Point, Union, South Dakota. 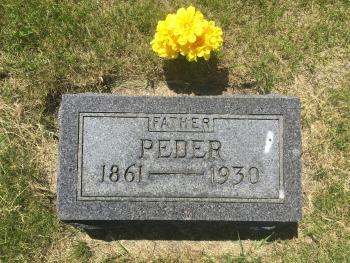 Peder Abrahamson died on 23 June 1930 at Lutheran Hospital from carcinoma gastric, Sioux City, Woodbury, Iowa, at age 68. He was buried on 26 June 1930 at Brule Creek Cemetery, Spink, Union, South Dakota. 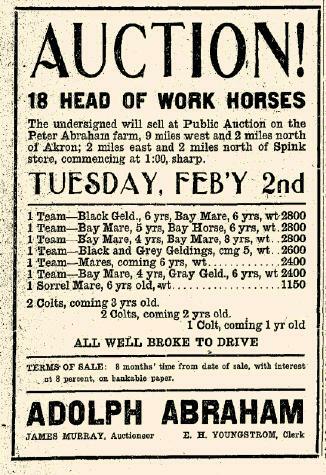 On 2 February 1926 at Spink, Union, South Dakota, held auction for sales of livestock. List: Fødte og døpte b 1847-1865. 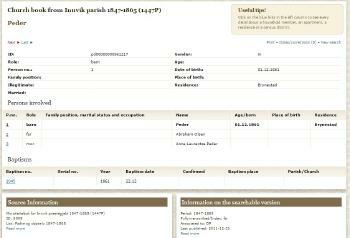 [S375] Norwegian National Archives Digital Archives, by Norwegian government, Section 9, group 63. [S245] U.S. Federal Census 1900 U.S. Federal Census, by Ancestry.com, Page 6. Stamp 251 A. ED #340. [S244] U.S. Federal Census 1910 U.S. Federal Census, by Ancestry.com, Pg. 3A. ED 430. #41, 35. [S243] U.S. Federal Census 1920 U.S. Federal Census, by Ancestry.com, Pg 3B. Stamp 269. ED 252. [S250] U.S. Federal Census 1930 U.S. Federal Census, by Ancestry.com, ED64-15. Dwelling 136. [S10] SD Beresford, Beresford Centennial book. [S200] e-mail address from the original atlas. The index was compiled by Joy R. Fisher Std Atlas of Union Co, SD, pg 29. Name Variation Sever Abraham was also known as Brynestad farm name. Name Variation Sever Abraham was also known as Sivert. 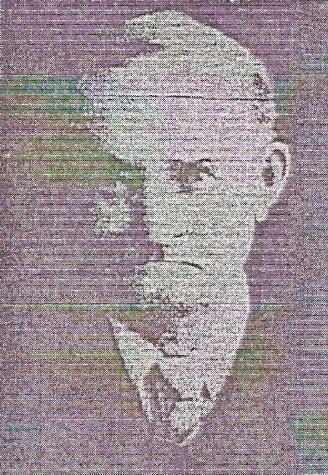 Name Variation Sever Abraham was also known as Syver Abrahamson. Name Variation Sever Abraham was also known as Seaver. Name Variation Sever Abraham was also known as Siver. Sever Abraham was baptized at Brule Creek Church, Union, South Dakota. He was born on 3 September 1870 at Olden, Nordfjord, Norway. 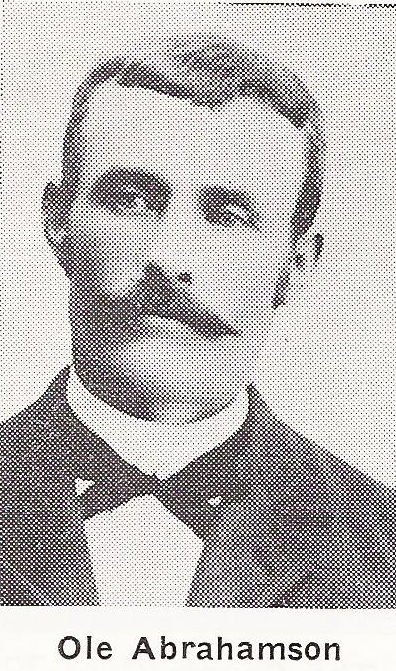 He married Anna Olina Christensen, daughter of Ole Ormbergstol Christensen and Ingeborg Johnsdatter Teigen, on 27 February 1896 at Brule Creek Church, Spink, Union, South Dakota. Sever Abraham died on 16 August 1952 at Johnstone Memorial Hospital, Beach, Golden Valley, North Dakota, at age 81 obituaries from Golden Valley News. 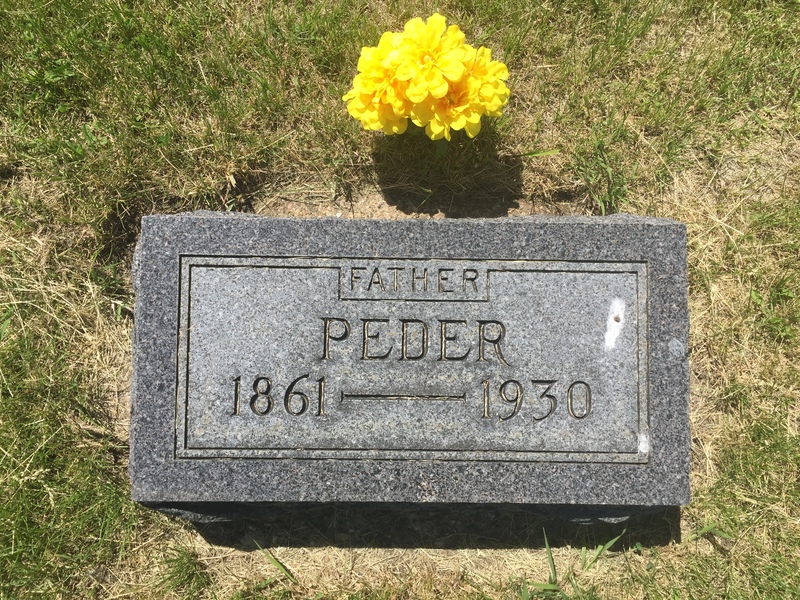 He was buried on 20 August 1952 at Beach Lutheran Cemetery, Beach, Golden Valley, North Dakota. 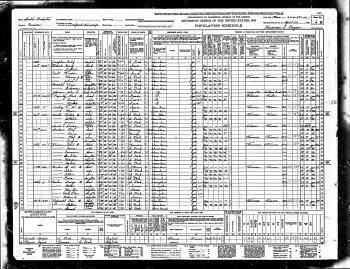 1 April 1925 Elk Creek, Golden Valley, North Dakota He appeared on the census of 1 April 1925 at Elk Creek, Golden Valley, North Dakota. "Built by R.Steele & Co, Greenock in 1873 for North German Lloyd of Bremen, the NURNBERG was a 3,116 gross ton ship, length 351ft x beam 39.1ft. 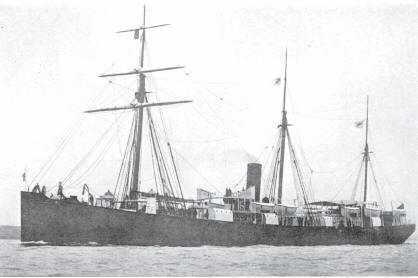 She had a straight stem, one funnel, two masts (rigged for sail), iron construction, single screw and a speed of 12 knots. There was accommodation for 34-1st, 33-2nd and 600-3rd class passengers. Launched on 9/9/1873, she sailed from Bremen on her maiden voyage to Southampton and Baltimore on 17/2/1874. On 11/9/1880 she commenced her first voyage from Bremen to Southampton and New York (9 round voyages)." Sever Abraham migrated in 1914 at Wibaux, Montana. He migrated in 1920 at Golden Valley, North Dakota. List: Fødte og døpte b 1865-1878. [S245] U.S. Federal Census 1900 U.S. Federal Census, by Ancestry.com, Pg 5. Stamp 250 B. #92, 92. 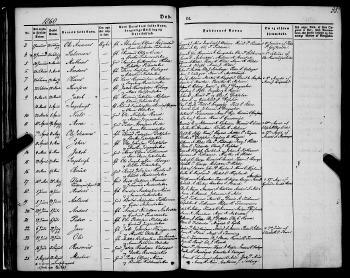 [S244] U.S. Federal Census 1910 U.S. Federal Census, by Ancestry.com, Page 2B. ED430. Dwelling 27, 30. [S297] Mrs. Leo A. Abrahamson, The Abraham Olson Family - Second Edition, page 88. Name Variation Ole Andreas Abrahamson was also known as Ole Andreas Abrahamsen Brynestad. Ole Andreas Abrahamson was born on 1 January 1860 at Olden, Nordfjord, Norway. 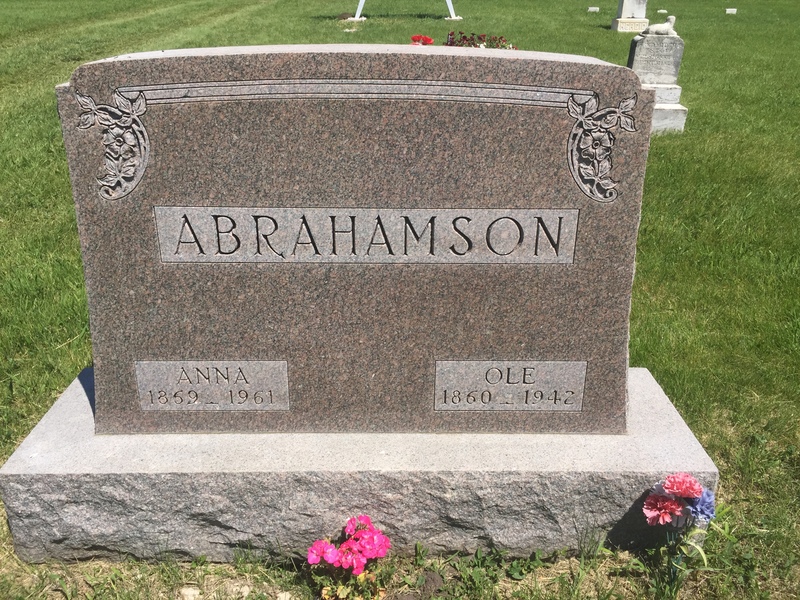 Ole Andreas Abrahamson witnessed the death of Abraham Olson on 24 July 1911 at from old age, Union, South Dakota; also reported as 24 Jul 1912; Abraham Olson obituary; Abraham Olson aged 82 years died Monday July 24, at the home of his son Ole Abrahamson near Spink of old age complications. 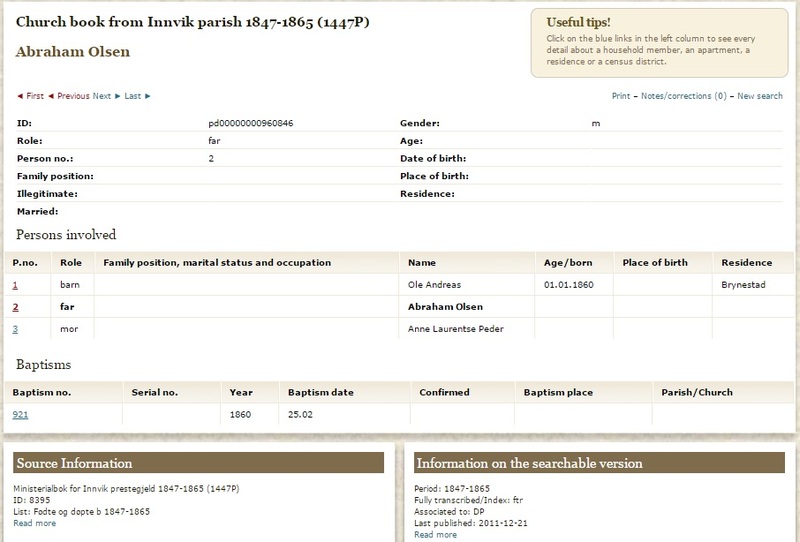 Deceased was born in Norway and had been a resident of Spink for more than 30 years. Besides a wife he is survived by two daughters Rachel and Mary of Sioux City and five sons, Ole, Peter, Andrew and Andy of Union county and Sever of Belle Fourche. 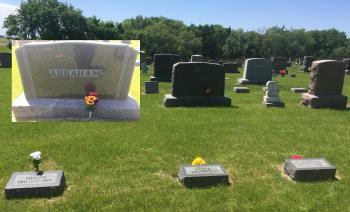 The funeral was held Tuesday and burial was made in the Brule Creek cemetery. Ole Andreas Abrahamson died on 17 February 1942 at arterio sclerosis, Union, South Dakota, at age 82 After fracture of femur on Dec 26, 1941 from fall in home. He was buried on 20 February 1942 at Brule Creek Cemetery, Spink, Union, South Dakota. [S17] Certificate, Anna M. Eide marriage of 15 sep 1898. [S245] U.S. Federal Census 1900 U.S. Federal Census, by Ancestry.com, Pg. 5. Stamp 250A. ED #340. #80,80. [S393] Brule Creek Lutheran Church, 100th Anniversary of Brule Creek Lutheran Church, pages 14-15. Name Variation Andrew Abraham was also known as Anders. 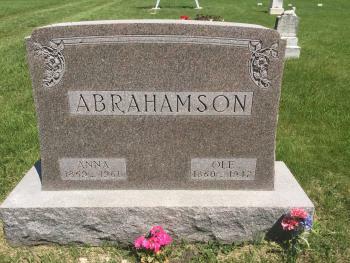 Name Variation Andrew Abraham was also known as Abrahamson. Andrew Abraham was born on 20 December 1863 at Olden, Nordfjord, Norway. 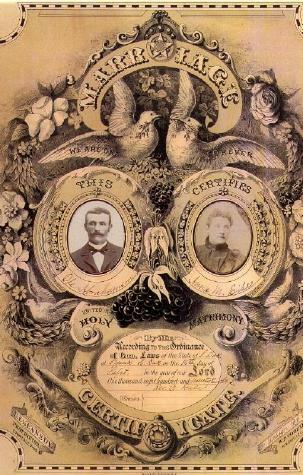 He married Lizzie Carrie Satter, daughter of Gundar G. Satter and Guri Anne Walstad, on 31 May 1888 at Brule Creek Lutheran Church, Elk Point, Union, South Dakota. 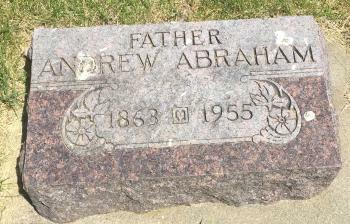 Andrew Abraham died on 23 January 1955 at Winter Nursing Home, Sioux City, Woodbury, Iowa, at age 91 from uremia; Andrew Abraham obituary. He was buried on 26 January 1955 at Brule Creek Cemetery, Spink, Union, South Dakota. "Built by R.Steele & Co, Greenock in 1873 for North German Lloyd of Bremen, the NURNBERG was a 3,116 gross ton ship, length 351ft x beam 39.1ft. She had a straight stem, one funnel, two masts (rigged for sail), iron construction, single screw and a speed of 12 knots. There was accommodation for 34-1st, 33-2nd and 600-3rd class passengers. Launched on 9/9/1873, she sailed from Bremen on her maiden voyage to Southampton and Baltimore on 17/2/1874. On 11/9/1880 she commenced her first voyage from Bremen to Southampton and New York (9 round voyages)." 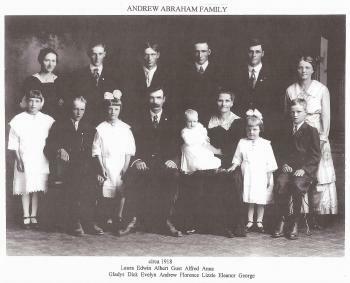 Andrew Abraham was naturalized in 1886 in 1920 Census for Spink, Union, SD. Andrew Abrahamson immigrated in 1881. He became a naturalized citizen in 1886. He lived in 1910 at Spink, Union, South Dakota, Abrahamson, Andrew Section 16 Spink Twp, T: 93N, R: 50W.9 Circa 1918 Andrew Abraham family portrait. 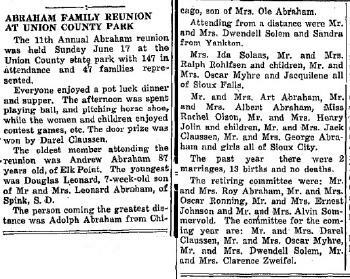 In June 1951 at Union County Park, Union, South Dakota, 11th annual Abraham reunion. [S245] U.S. Federal Census 1900 U.S. Federal Census, by Ancestry.com, Pg 4. Stamp 249A. ED #340. #64, 64. 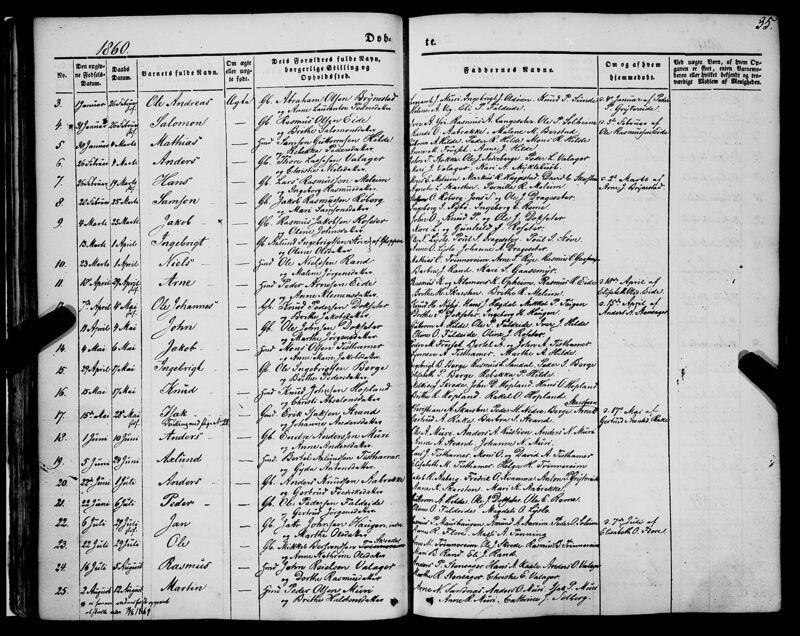 [S244] U.S. Federal Census 1910 U.S. Federal Census, by Ancestry.com, Page 7B. ED #430. #125, 132. [S243] U.S. Federal Census 1920 U.S. Federal Census, by Ancestry.com, Pg 4B. ED 252. [S250] U.S. Federal Census 1930 U.S. Federal Census, by Ancestry.com, ED64-15. Dwelling 78.